Moms and dads don’t necessarily see eye to eye when it comes to how certain tasks are divided at home. More fathers than mothers in families with two full-time working parents say they and their partner share responsibilities about equally when it comes to managing the children’s schedules and activities, caring for sick kids and handling household chores, according to a new Pew Research Center survey. Mothers in these families see it differently: Many say they are doing more when it comes to these tasks. 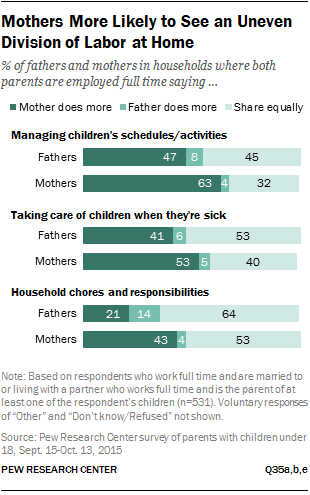 For example, in families with two full-time working parents overall, 59% of parents overall say they and their partners share household chores about equally, while 31% say the mother does more and 9% say the father does. Moms, however, are twice as likely as dads to say they handle more of these tasks. For their part, most dads see a more even division of household chores: 64% say they and their partner share this about equally. 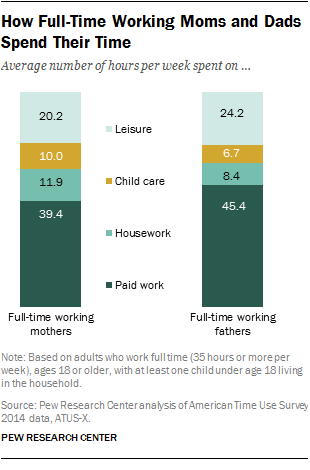 While it’s hard to say whose account is the most accurate when it comes to how parenting and household responsibilities are shared, an analysis of the American Time Use Survey (ATUS) data provides a glimpse into how full-time working moms and dads spend their time. This analysis shows that while full-time working moms spend more time than full-time working dads on parenting and household tasks, the difference is modest. For example, mothers who work full time spend an average of 11.9 hours per week, or 1.7 hours per day, on housework, compared with 1.2 hours per day among fathers who work full time. When it comes to child care activities, including managing schedules, driving kids to activities, providing physical care, and helping with homework, full-time working moms spend an average of 1.4 hours per day, just slightly more than the 1 hour per day full-time working dads spend on these activities. Fathers, for their part, put in more time at work, but here, too, the difference is modest. Full-time working dads spend about an hour more per day on paid work than full-time working moms (6.5 hours vs. 5.6 hours per day). While working moms and dads may have different perceptions of who’s doing more at home, they agree that balancing work and family responsibilities is difficult: 57% of full-time working parents say it’s hard to strike a balance, and 46%, including half of full-time working dads, say they don’t spend enough time with their kids. In a 2013 survey, 41% of parents with children under 18 (including somewhat similar shares of mothers and fathers) said it was extremely important for them to have a job that allows them to take time off for child care and family issues.